Fly Fishing In Yellowstone National Park: "HOLY THERMOMETER," Batman . . .
"HOLY THERMOMETER," Batman . . .
.. Don't fish the Firehole River. Fish the Gibbon River if you must - but only in the morning or evening. The Madison River works but is fair to poor, (unless evening caddis is your game - then it's spectacular!). Slough Creek is where it's at, for now, - and warming quickly, (can you say early hoppers?) Even Soda Butte Creek is spiking into the high 80's, and becoming the most crowded river in the park - and that's saying something. .. If you want consistent action and active fish in cold water there are few easily accessible waters. The Gallatin River is popping at what is probably it's seasonal best. 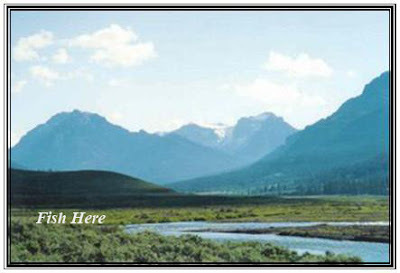 Fan Creek is too low and too hot; the same for Grayling Creek, Duck Creek, Iron Spring Creek, and the Little Firehole. Leave the poor fish to their own devices - enough are dying already. .. As people anticipate the opener on the Yellowstone River, (July 15,) they should keep in mind that the current flow from the lake outlet is more than 1,500 cfs below the anticipated seasonal average. The river should fish well for a week or two, depending on weather and pressure. .. It's a fine thing when the feather merchants fish. It's a better thing when they tell us about it. Visit Bud Lilly's for a comprehensive area report. Check out Madison River Outfitters for a bit of local insight into the Yellowstone scene, (and a very pretty cutthroat from Slough Creek.) Bob Jacklin has revamped his web page and expanded the Yellowstone Waters section, (look for the new stuff at the fishing report tab.) Bob continues to hold his free casting clinic every Sunday in West Yellowstone. The good folks at Parks' Fly Shop are right on with this week's tip, click on over to see for yourself. .. The Horse's Mouth has put to shame the nay, (neigh?) sayers by bringing forth a plethora of posts ranging from a complete text of the Declaration Of Independence to some of the finest wahines yet honored. Check out the photo of the surfing whale. .. From Protect Your Waters comes a note about the spread of Eurasian Milfoil into the waters of Montana. The original article is in The Missoulian. The plant is only known from one body of water, (Noxon Reservoir,) at the current time and herbicide and drawing down the reservoir in the winter are being considered by Montana FWP officials. .. The Monterey County Herald lets us know about the Extinction Stops Here roadshow. 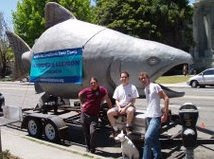 The show features a 25-foot long, (two ton,) replica of a Pacific King Salmon. It's currently playing at the Monterey Aquarium. The roadshow is part of a public education campaign by Save Our Wild Salmon.